How Do You Write a Love Story? 2. Pinpoints Story problems without abusing you, the writer. The Story Grid asserts that you are not the problem. The problem is the problem. 3. Reveals—in very specific terms—what you must do to fix your Story’s problems. 4. Guides you in re-envisioning and resuscitating a seemingly irredeemable pile of paper you’ve stuck in an attic drawer. 5. Helps to inspire an original creation. Why Is Pride and Prejudice the Consummate Love Story? You’ve read Jane Austen’s classic Love Story and you aspire to write one yourself. In a magical world, Jane Austen would sit down with you and explain how she wrote a novel that sells approximately 400,000 copies a year…more than two centuries after it was published! In the real world, The Story Grid Edition Pride and Prejudice is the next best thing. By transforming the reading experience into writing inspiration, it breaks down how Jane Austen abided by the five commandments of storytelling in each and every scene of her novel. And it shows you how she delivered the obligatory scenes and conventions of the Love Story genre. 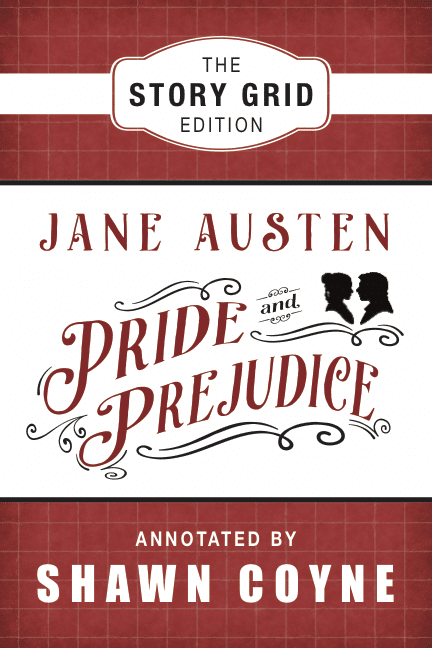 The Story Grid Edition Pride and Prejudice details the craft behind the dazzling storytelling and shows you how to tell your own best Love Story.